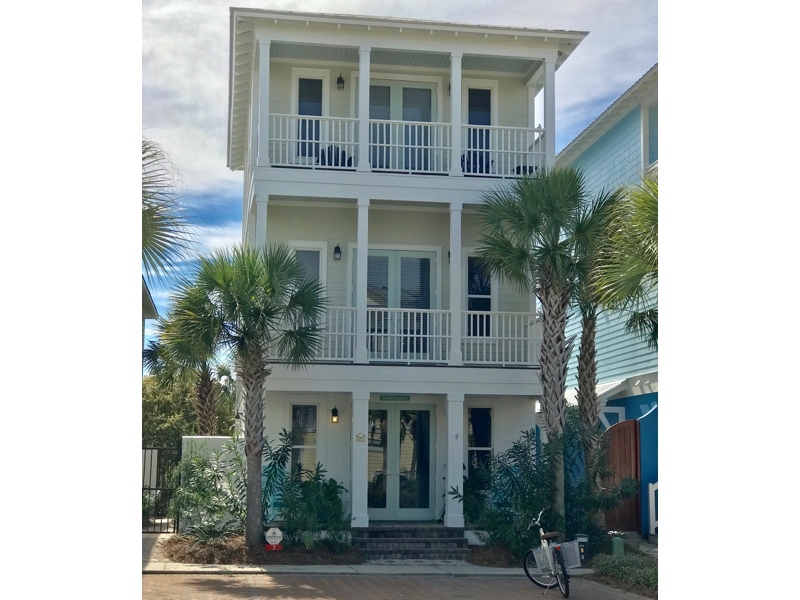 When you pull into 3 Trigger Trail in Seacrest Beach for your vacation, you will be greeted by a beautiful home with serene, beach chic style. There are 4 bedrooms, 4 bathrooms, a porch, and 4 balconies. As you enter the home from the front porch, soft blues and greens, coupled with beach textures and custom lighting, fill the home with luxury and sophistication. The living and dining is open to the wonderful kitchen. Plenty of seating along with the table for 8 and additional seating for 4 at the bar, has room for everyone. The kitchen is finished with beautiful quartz, stainless steel appliances, and lovely cabinets. There is a full sized laundry room off the kitchen with a washer and dryer. The downstairs bedroom features a king size bed and bathroom with a shower. There is also a laundry and storage room right off the kitchen. On the second floor, there are two bedrooms. The first bedroom includes a king size bed, private bath with shower, and a private balcony. The other bedroom has four twin beds and a private balcony. It also has a bathroom with double vanity and separate tub and shower. On the third floor, the amazing master suite is the first surprise. It features a king bed, private balcony, and bathroom with double vanity and shower. The next surprise is the bar area, which features a sink and refrigerator, as well as a place to lounge. The crowning jewel has to be the wonderful balcony with a great view of the gulf and plenty of seating for memorable sunsets. Take a short stroll or call the private shuttle to enjoy the fabulous 12,000 square foot pool or the sugar white sand of the beach. The pool is incredible with lush landscaping, ample beach chairs, waterfalls, fountains, and children’s areas. It is truly a paradise. Or maybe you want to head to the beach. Your private shuttle will take you and pick you up at the steps leading down to the beach, where private chairs and umbrellas are available. Beautiful Highway 30-A will draw you in by the laid back pace and lush nature. Less known than Destin or Panama City, there is less traffic, less crowds, but many shops, restaurants, and activities to keep you entertained. – Concierge available through Benchmark Management – visit Benchmark30a.com/concierge for more information!